In the same vein as our game changing Escape, the Felon is a fairway driver that feels great in your hand and comes out easy. Crafted in response to the unforgiving Kansas winds, the Felon is the wind-fighting fairway driver that your bag is calling for. It will continue to sail, without turning over, despite the headwind that is challenging your confidence. When the wind is down, it has an incredibly predictable hyzer finish. 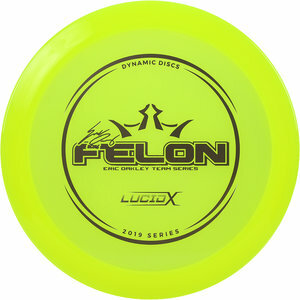 When you are facing a low ceiling shot where you need good glide and a strong finish the Felon is your answer. You asked and Dynamic Discs has delivered. A big portion of each sale goes directly to Eric Oakley and his touring efforts.